For me, crunch is essential in a salad. So I usually toss in some toasted sunflower seeds, croutons, or for special occasions, cocoa nibs (also known as cacao nibs), which add a savory dark-chocolatey bite. Balsamic vinegar and cocoa nibs dance especially well together – a perfect pairing of sweet, tart and bitter. 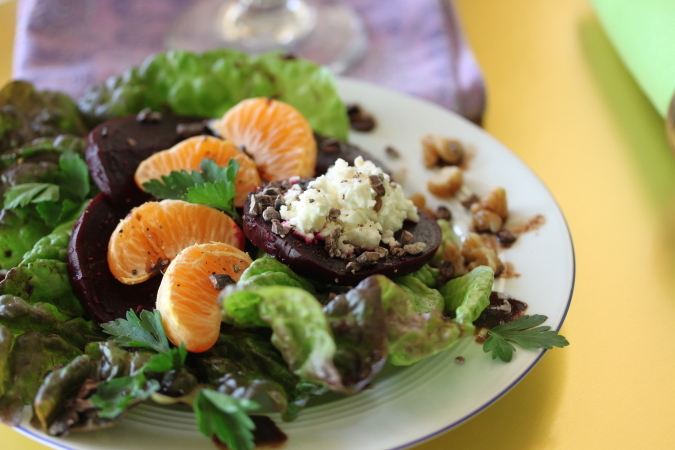 Essentials and options: Just three main ingredients are essential to this salad: roasted beets, mandarin oranges, and cocoa nibs – plus the dressing. Mandarin oranges are typically marketed these days as Clementines or Cuties. Other good (and optional) salad add-ons: goat cheese or feta crumbles; toasted walnuts or hazelnuts; toasted sunflower or pumpkin seeds; chopped Italian parsley or cilantro; and lettuce or other greens, like arugula, spinach or baby greens. Dressing: The dressing is a basic balsamic vinaigrette laced with cocoa powder and cinnamon. Taste and tweek, then drizzle. Don’t forget to show off how pretty this dish is before mixing and serving. Roasted Beets: No roasted beets on hand? Make them a day or three in advance: Rinse 3 to 4 large beets, trim off the leaves, wrap each beet separately in foil, and set in a baking dish (I use a glass baking dish, to catch any juices that may leak). Roast at 400 degrees F. (375 degrees if using convection mode), for about an hour, or an hour and 15 minutes if plump. They should be tender when pierced with a knife tip, but a bit under- or over-cooked won’t hurt them. Let them cool in the foil. Refrigerate until ready to use. You can refrigerate them in their foil for several days, and use them as you wish. Be careful: beets stain, so store them in glass or ceramic (not plastic). Handle with gloves, or coat your fingers with oil before handling. Layer the greens on a platter or salad plates. On top of the greens, arrange the oranges, beets, and cheese (if using). Be artistic. Combine all vinaigrette ingredients; stir or whisk thoroughly to blend in the cocoa powder and cinnamon. Drizzle over the salad. Sprinkle on the cocoa nibs, salt, and pepper to taste. Voila! Serve as a main dish with hot and hearty bread, or as a side dish.